"...the green, sticky spawn of the stars, had awaked to claim his own. The stars were right again, and what an age-old cult had failed to do by design, a band of innocent sailors had done by accident. 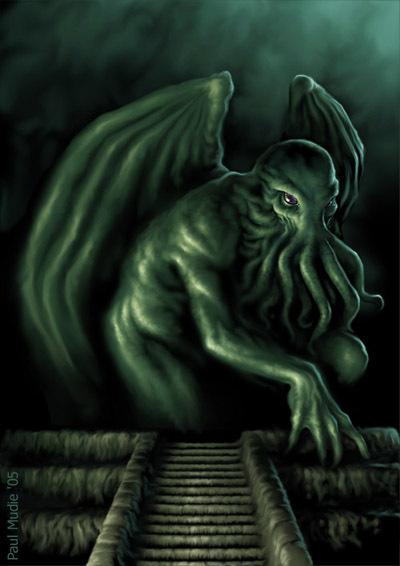 After vigintillions of years great Cthulhu was loose again, and ravening for delight." - HP Lovecraft's The Call of Cthulhu. Used (with added aging effects) as the cover for The First BHF Book of Horror Stories. Also used as the front cover for Chronik des Cthulhu-Mythos II, published by Festa Books in Germany.